BIRMINGHAM, Ala. – About 350 interested consumers came to Brookwood Village on Saturday to shop – in a manner of speaking. Instead of browsing through the mall, though, these “shoppers” were in the parking lot examining dozens of electric vehicles on hand to celebrate National Drive Electric Week. The visitors learned plenty from the electric vehicle (EV) owners on hand for the showcase. In addition to the replica 1896 Riker electric motor car, there were 25 new and used EVs from Nissan, Chevrolet, Tesla, Ford, BMW, Fiat, Toyota, Honda and Cadillac on display at the event. Also on display was a Via Motors, Inc., pickup and a pair of Curtiss Motorcycle Company electric motorbikes. Curtiss is a Birmingham-based company that manufactures and sells high-end, high-performance electric motorcycles. 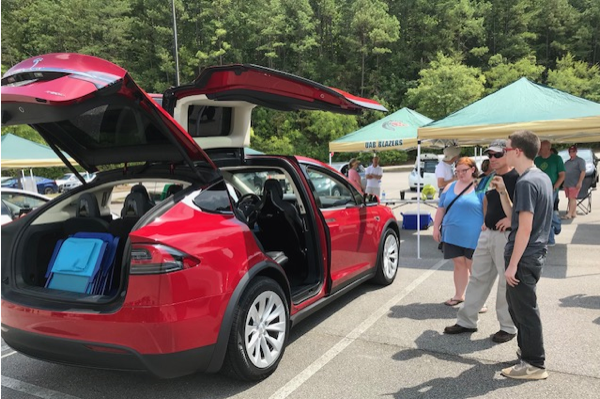 “It was wonderful to have such great participation from electric vehicle owners and manufacturers,” said Mark Bentley, executive director of the Alabama Clean Fuels Coalition. “Electric vehicles make up the fastest-growing segment in the automobile industry in the United States and the EV owners who are here are among the best ‘salesmen’ there are, just by telling their stories of being on the road – and how much money they save by using electricity instead of gasoline. “Electric vehicles are being built in 20 states, including Alabama, and the EV industry creates thousands of well-paying jobs in our state and country and reduces our dependence on foreign oil,” he said. Cedric Daniels, Electric Transportation Manager at Alabama Power; Louis W. Baxley, Special Projects Coordinator for U.S. Senator Doug Jones; ZEOG’s David Radzieta; Julie Price, Director of Sustainability at UAB; and Cedric Roberts, the City of Birmingham’s Equipment Management Director, were also on hand at the four-hour event to lend support to the electric vehicle industry. Come to Brookwood Village September 8th to view the latest Electric Vehicle (EV) offerings. Talk to real EV owners! Come see why EVs are the fastest-growing transportation vehicle segment. You have been reading about EVs in the news -- now see the best new and used EV models on display: Nissan, Chevy, Tesla, Ford, BMW, Fiat, Toyota, Honda, Cadillac, Chrysler, Hyundai, etc. EVs are fun to drive, are less expensive to operate, and are easy to fuel compared to gasoline vehicles. Also, EVs are better for the environment (no emissions), promote local jobs, and reduce our dependence on foreign oil. Stop spending $75 +/- a week feeding that gas-guzzling vehicle, and get behind the wheel of a fun to drive, economical EV. Many EV models are even made in America in emission-free factories. If you are served by Alabama Power you can also save on your electric bill with an Alabama Power EV rider to charge your EV, at a reduced rate, overnight at home. Ask us how on the 8th! Ample parking is available. After reviewing your favorite EV models, be sure to stick around for world-class dining and shopping at Brookwood Village. There are currently 64 attendees registered. Registered attendees report 378,613 electric miles driven.